This fact sheet summarizes findings for Assam from a 2015 study that provides the first comprehensive estimates of the incidence of abortion and unintended pregnancy in six states in India. An estimated 580,100 abortions are performed in Assam annually. For 2015, this translates to 66 abortions per 1,000 women of reproductive age (15–49). Twenty-one percent of abortions occurring annually in the state—an estimated 122,300—are provided in health facilities. Nearly 90% of these are surgical and about 10% are performed using medical methods of abortion (MMA).† Seventy-three percent of facility-based abortions are provided in public facilities, while 27% are provided in private facilities. 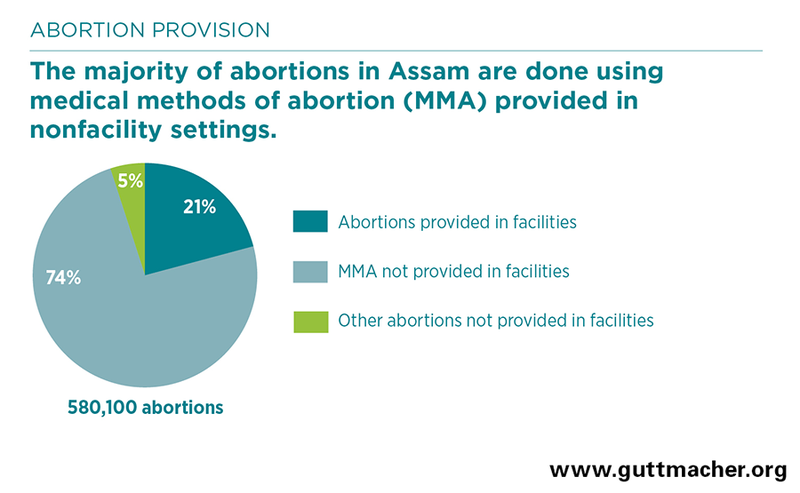 The majority of abortions in Assam (74%) are done using MMA obtained in settings other than health facilities. Five percent are performed outside of health facilities using other, typically unsafe methods. An estimated 55% of all pregnancies in the state—782,100 in 2015—are unintended. Almost three-quarters (74%) of these unintended pregnancies end in abortion. Each year in Assam, roughly 66,600 women obtain facility-based postabortion care for complications resulting from induced abortion or miscarriage. An important minority of postabortion care patients experience one or more severe complication, such as infection (4%), physical injury (2%), sepsis (3%) or shock (1%). These complications are most likely the result of nonfacility abortions using methods other than MMA. As of 2015, an estimated 588 facilities in Assam provide abortion-related care (induced abortion, postabortion care or both types of services); 61% of these facilities are public and 39% are private. Among facilities offering any abortion-related care, about 66% provide both induced abortion and postabortion care, 30% offer only postabortion care and 4% offer only abortion. Only 29% of public facilities offer any abortion-related care. This includes the majority of higher-level public facilities—97% of hospitals and 61% of community health centres—but only 20% of primary health centres. Although 85% of women in Assam reside in rural areas, just 45% of facilities offering abortion-related services are located in these areas. The vast majority (94%) of facility-based abortions take place in the first trimester of pregnancy (up to 12 weeks’ gestation), and nearly two-thirds occur in the first seven weeks of pregnancy. More than two-thirds of facility-based abortions are performed using the techniques recommended for early termination: manual or electric aspiration (57%) and MMA (13%). Although only 6% of facility-based abortions occur after the first trimester, nearly one-third (30%) are performed using more invasive surgical procedures not recommended in the first trimester (dilatation and evacuation or dilatation and curettage). In Assam, 37% of public facilities that offer any abortion-related services provide only postabortion care. Among these facilities, the most common reasons reported for not offering induced abortion are lack of trained staff and lack of equipment or supplies. Unlike public facilities, which are automatically approved to provide induced abortion if they have a certified provider, private facilities must obtain registration before offering that service. 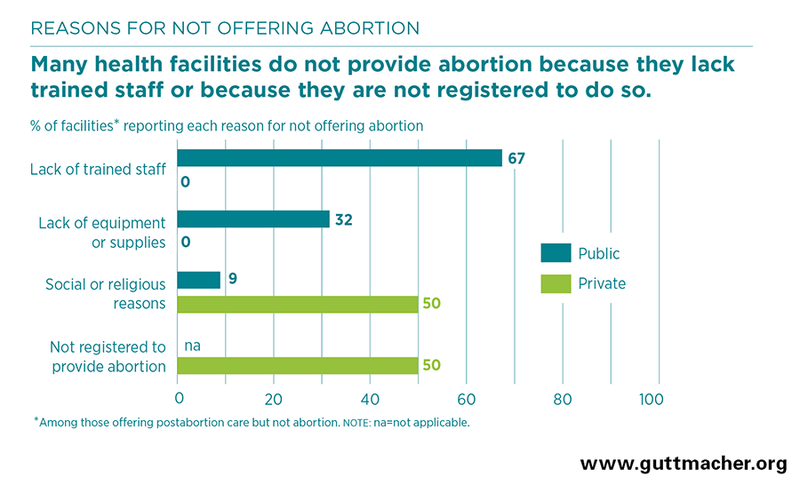 Among private facilities offering any abortion-related care, 20% offer only postabortion care; for them, the most common reasons for not providing abortion are lack of registration and social or religious concerns. Staff at health facilities cite cost as a key barrier preventing women from obtaining safe abortion care. Other such barriers include fear of social stigma and distance or transportation issues. The study on which this fact sheet is based was made possible by grants from the Government of UK Department for International Development (until 2015), the David and Lucile Packard Foundation and the John D. and Catherine T. MacArthur Foundation. The views expressed do not necessarily reflect the official policies of the donors.